Description: Like Chinese food? Think Sweet and Sour. Yum! The ascent along Sunshine Canyon trail and Lion's Lair is sweet, sweet single track winding through wildflower covered valley and pine forest as you switchback your way up the newly opened (fall 2014) west approach to Mt. Sanitas. The sour pucker factor kicks in on the descent along the Mt. Sanitas Ridge trail as it drops 1,300' over 1.4 miles, on a rugged backbone of steep, off-camber, and loose rock. Mt. Sanitas is often referred to as the transition point between the Prairie Grasslands life zones of Eastern Colorado and Kansas, and the Montane Forests life zones of the Rocky Mountains. This loop hike will start you out firmly in the Ponderosa pines of the Foothills and drop you back down into the edge of the grasslands with beautiful views of the eastern prairies along the Mt. Sanitas Ridge Trail. With great views of the Continental Divide along the way, the hike provides you with arguably the best variation of different experiences you can get on a single 6 mile hike in the Front Range. And all within an easy walk from downtown Boulder! Boulder Trivia! Most locals pronounce Sanitas with the emphasis on the second syllable, San-EE-tas. However, those wise hikers like you know that Mt Sanitas was named for the sanitarium, the "San", that was built near the junction of Mapleton and 4th St in 1896, and that the correct pronunciation is to put the emphasis on the first syllable, SAN-ee-tas. The word Sanitas is latin for 'health'. Challenge Level: Intermediate, 5.8 Miles, 1,532' Total Elevation Gain, 3 to 4 Hours Lion's Lair trail is an example of how new hiking trails should be built. It's smooth, leverages long, flowing switchbacks, and makes the climb to Mt Sanitas not only very doable, but gorgeous as well. There are several places to stop on the four mile ascent to rest and even have lunch if you desire. But, as I was descending Mt. Sanitas Ridge, looking for firm footing and hand holds, attempting to prevent a trip, fall or face plant, I realized I may have put this hike out of the reach of some hikers by including the ridge trail. It's a precarious drop, literally along the ridge, or backbone, of Mt. 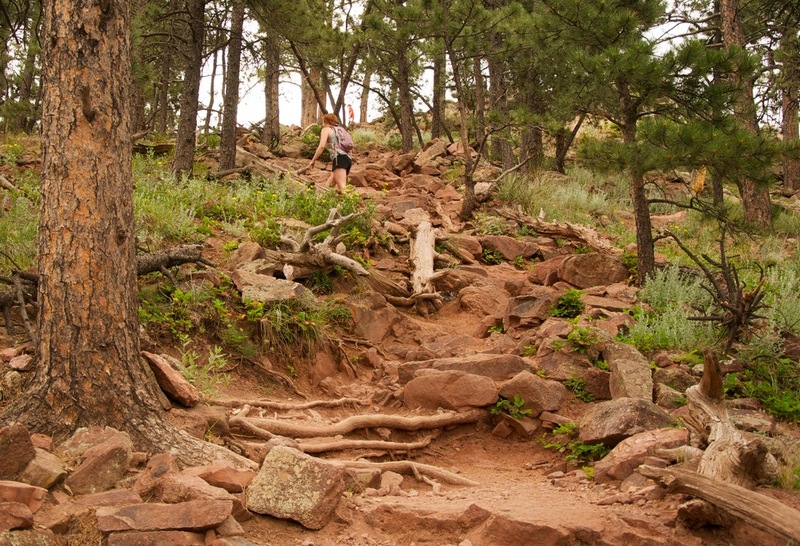 Sanitas, and easily adds two levels of difficulty to this hike. I don't want to sound too much like a hiking prude here, because you will see all ages and abilities of people hiking and even running Sanitas Ridge. However, if not used to the pitch, rockiness, and sever off-camber angles this trail can be more than daunting; it can be dangerous. Click on the photos above of the hike and focus on those after the Sanitas plaque pic to get a good feel for the difficulty of the ridge descent. To that end, I opted to also add a second Lion's Lair out and back guide which summits and returns from Mt. Sanitas via its gentler western slope. Please check out our Lion's Lair guide if a shorter, gentler hike up Sanitas would be better for your outing. You'll still get all the sweet, just without the sour! Parking and Trailhead: Centennial Trailhead on the left just past the old hospital offers the most parking options. However, the trails in this area are popular and the parking spots fill fast. There is also angle and parallel parking along Mapleton. During summer weekends my motto is if I see a space west of 4th on Mapleton I take it! Trail Guide: Depending on where you find parking, make your way west on Sunshine Canyon to the Centennial Trailhead parking area. In the back of the parking lot you will find a trail sign and a set of steps near a couple of picnic tables. Do not confuse it with the trail by the restrooms, which is where you will return. Head up the stairs, cross over historic Silver Lake Ditch and turn to the right. You should immediately see a green sign indicating you are on the Sunshine Canyon Trail. Follow the SCT up through the valley on a smooth, dirt surface for 1.3 miles. As you near the end of the SCT you will see a sign that you are on private land and to stay on the trail. Continue on the trail. A short while later you will pass through a wire fence onto a private drive. There is a sign here that indicates you must turn right to Sunshine Canyon Dr. When you get to the road look up the street about 100' and you will see a drive on the opposite side of the road and the trail continuing westward. Cross the street and head up the slight rise. For your return, head back down from whence you came, past the turnoff for the LLT. Stop for a moment to appreciate the deep red jagged line that is the MSRT. It doesn't get any better than what you are seeing right now. In fact, it gets worse. If you have concerns, you might want to considering returning the way you came, via Lion's Lair. If you are sure footed, sure minded, and ready to be cautious, then proceed downhill on the MSRT. At the 5.5 mile marker you will reach a trail split at the bottom of the MSRT. Here there will be a blue sign posted with some information about Mt Sanitas. To return to the Centennial parking area take the trail downhill to the right. You will pass over a small creek, through a shelter and then follow the gravel trail to the right of Sunshine Canyon Rd until you come to a crosswalk. Cross Sunshine Canyon and take the split right back to the restrooms and parking area. If you parked on Mapleton or near the old hospital continue straight and downhill at the blue sign. Map Resources: EveryTrail Map. 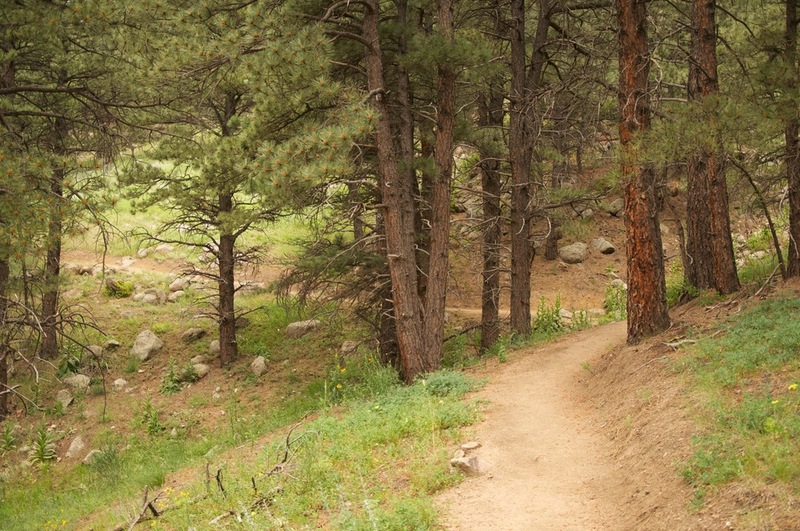 You won't yet, as of summer 2015, find Lion's Lair on any of the Boulder Open Space and Mountain Park maps. It's just too new. 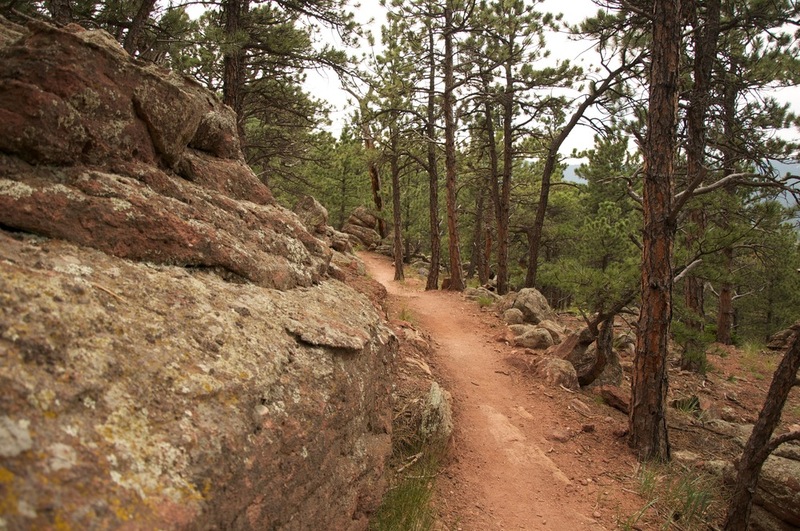 However, you can find the map containing Sunshine Canyon and Sanitas Ridge trails here. Picnicking: There are a couple of picnic tables in the Centennial parking area, but they are not overly inviting. A better option if traveling by car would be to head back toward town on Mapleton and turn left (north) on 9th. After a few blocks you will come to North Boulder Park which has shelters and plenty of picnicking options. Dog Friendly: No. Dogs are not allowed on the Lion's Lair trail. Cell Service: Not so good on Lion's Lair, but okay elsewhere.